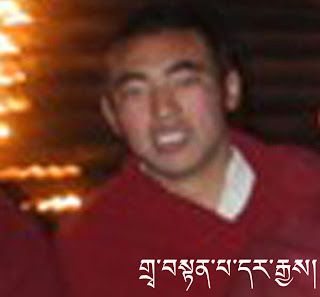 Tenpa Darjey, a 22-year old monk from Tsodun monastery in Ngaba, set fire to himself, along with fellow monk Chimey Palden, aged 21, on March 30, 2012 outside the prefectureal government offices in Barkham, Ngaba. The area is now under lockdown by armed troops and no further information is known about the two monks’ survival or current whereabouts, according to the Kirti monks in exile. Tenpa Darjey studied philosophy at Kirti monastery in Ngaba county, Ngaba Tibetan and Qiang Autonomous Prefecture, Sichuan, from 2003-2009. He then returned to Tsodun where he was regarded as one of the best students in the logic and debating class. He was the youngest of four brothers and sisters.